It has been a heatwave here in Hamburg and I have discovered so many new things with this weather. For example, I’m riding my bike the 7 km/4.5 ml to and from work, hitting golf balls at the driving range and discovering new drinks to rehydrate. 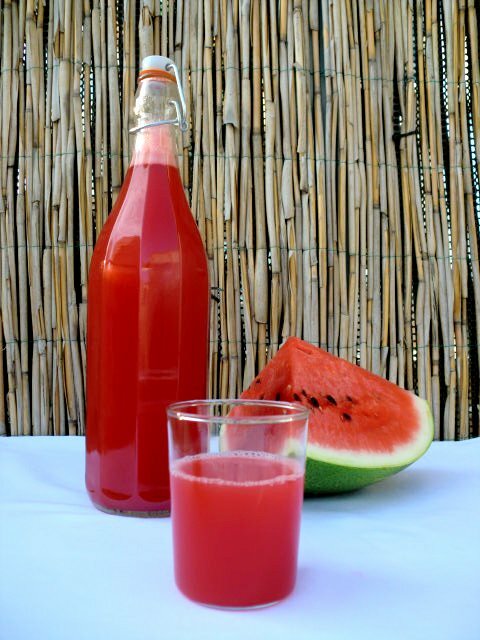 And the drink of the summer is Watermelon Juice! It’s beautiful, it’s pink and it’s exploding with sweet flavor! It’s exactly what your body needs in this peak of the summer heat! The work is minimal, chop the watermelon as usual but into smaller cubes. Add to the blender, with the seeds still in the watermelon and blend on low just enough till it starts to swirl around like a liquid. You might need to use a muddler to push down the watermelon. Strain the seeds by pouring the juice through a nut milk bag, mesh strainer or cheesecloth. Since watermelons are basically all water and small amount of pulp, they produce so much juice and I had to run out and buy more bottles to store it in. There seems to never be enough of this absolutely delicious drink as we are always grabbing a bottle to take to the beach, work or to enjoy on the balcony on a hot summer evening. Happy Heatwave Everyone!! This entry was posted on July 12, 2010 by Olive. It was filed under Uncategorized . I love watermelon in any form! 🙂 YUM!